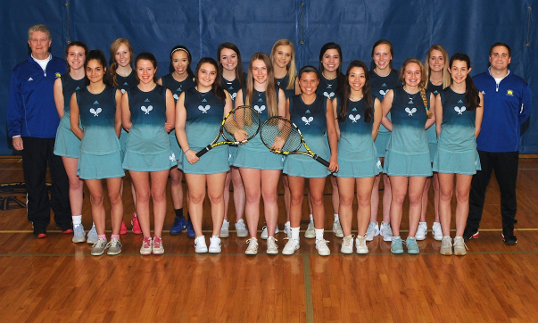 There will be a Girls Tennis callout meeting Tues., Feb. 12, 2019 at 7:20 a.m. in Rm. 111. All returning and new players are encouraged to attend this informational meeting. 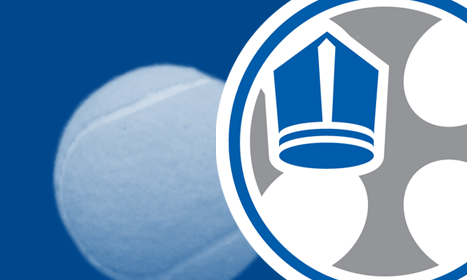 If unable to attend, please email Coach Huffman, chuffman@bishopchatard.org. In a mental test more than anything, the Lady Trojans prevailed 5-0 in their season opener. Spring tennis in Indiana reared its head, with a windy testament to the girls’ fortitude. #1s Alysa Guffey (12) lost her first game of the match before she found her footing and strung together 12 of the next 13 games to win 6-1, 6-1. Sarah Scheidler (12) picked up her first varsity singles win 6-1, 6-0 at #3s. All the while, Claire Williams (12) & Belle deCastro (11) won their first match together 6-2, 6-1 at #1d. Lucy Park (12) on her 18th birthday! celebrated a win with Katie Barnes (12) at #2d 6-0, 6-1. The last point in the bag for the Trojans, #2s Sydney Sorensen (11), battled early nerves and the wind as she navigated her way to a 6-2, 6-2 win. The Lady Trojans move to 2-0 heading into spring break after a strong early season performance in Lebanon. #1s Alysa Guffey won in straight sets 6-2, 6-1, with #3s Addi Laux coming home with a white ball 6-3, 6-0 win! At #1d Belle deCastro & Claire Williams faced down a strong doubles team at the net 6-3, 6-2. Lucy Park & Katie Barnes also picked up a white ball win 6-3, 6-0 at #2d. The story of the night came from a gutsy performance out of Katie Guymon. In her first varsity experience, Katie stepped in at #2s and won the first set 6-4. She was outlasted in the final two sets 4-6, 4-6 by a #2s gal that will be around for awhile. Great efforts all around! #1s Alysa Guffey found her strokes early and rolled to a 6-2, 6-1 win. #3s Addi Laux didn’t drop a game en route to her 6-0, 6-0 win. #1d Belle deCastro and Claire Williams overcame a second set fitness test to pretzel stick their opponents 6-1, 6-1. Rounding out wins for the Lady Blue was #2d Lucy Park & Katie Barnes 6-3, 6-4. #2s Sydney Sorensen took one on the nose against a formidable freshman 5-7, 2-6. She’s hungry to rebound tomorrow and grow from her match. Great players are made for great moments, on Chatard! In a highly anticipated dual match, the Lady Trojans fell big 0-5 to #18 ranked Brebeuf. At the onset of the match, the Lady Trojans were competing well. #1s Alysa Guffey got off to a hot 1-0 start, but abruptly lost confidence in her consistency while falling 2-6, 2-6 to a junior she was 1-0 against in her career. The ripple effect trickled all the way through the roster as the wheels quickly came off. #3s Addi Laux was “top-spinned” off court second falling quickly 2-6, 1-6. #2d Lucy Park & Katie Barnes struggled to handle the service and net play of the Braves duo while they fell 2-6, 0-6. #1d Claire Williams & Belle deCastro quickly followed in a 2-6, 3-6 loss that saw the Braves dominate the net for the win. Sydney Sorensen was the last point on court at #2s, and while she dug deep into her bag of tricks clawing her way back from a 1-5 first set deficit to 3-5, it was too much to fight off a formidable opponent, and she fell 3-6, 2-6. The force was strong in the singles line up tonight. 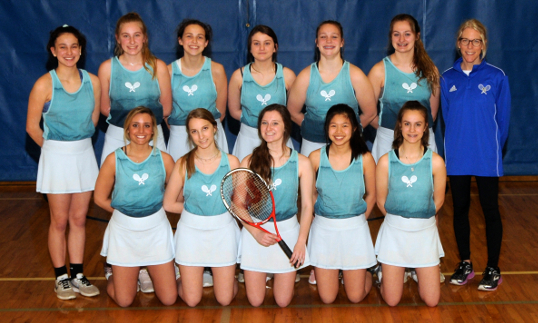 The girls only lost a cumulative six games across the three courts, winning each match in straight sets. Claire Williams and Belle deCastro won 6-0, 6-4 at #1d in what started to be a chilly end to the evening. The last point for the Lady Trojans came at #2d where Lucy Park and Katie Barnes overcame some mental adversity (and a lot of missed volleys) before winning 6-2, 0-6, 10-7. Coach was pleased with this team effort tonight against #1 state ranked cathedral. Alysa faced a #1s player who is challenging back and forth between #2 and #1 this season on arguably the states best toughest singles line up. She held a slight advantage at 1-1 up 40-0 in the second set of the match with a great chance to change the momentum, but just couldn’t convert before falling 0-6, 1-6. Lucy Park & Katie Barnes put up a fight at #2d, conjuring up an hour long first set. They ultimately fell 4-6, 2-6 in the final match of the night. Three points is all it takes! Lucy Park & Katie Barnes came away with a 6-2, 6-1 win at #2d. Belle deCastro & Claire Williams battled through a tough first set winning 6-4. The duo had no problem closing off the Wildcats, winning the second set 6-0. Sydney Sorensen brought home the winning point at #2s. Sorensen reversed her results from two years past and clinched the critical third point of the night 6-2, 6-2. Alysa Guffey squared off against an illness substitution from Warren Central, taking her match 6-1, 6-1. Sydney Sorensen enjoyed cleeeaaan livin’ with a 6-0, 6-0 win against a very good #2s opponent (and their former #1s player). Sarah Scheidler played a heartfelt match at #3s before falling 3-6, 4-6. Belle deCastro & Claire Williams strung together their gutsiest performance of the year with a tight 7-5 first set win. These two took control at the net and played high IQ tennis to win 6-1 in the second. Lucy Park & Katie Barnes didn’t lose a game en route to 6-0, 6-0 win at #2d. Katie Guymon (11) & Gabby Croddy (10) did not lose a game in their season opener, debuting at #1d with a 6-0, 6-0 win. Zizi Wuensch (9) & Peyton Bean (9) were victorious in their first ever match as Lady Trojans 8-2 at #2d. Congratulations girls on your first career wins! Caroline Machala (11) earns her first wins of the season at #1s & #3s, 8-1, 8-0 respectively. Gabby Croddy (10) fell at #2s 5-8, before earning an 8-1 win at #4s. Zizi Wuensch (9) & Peyton Bean (9) add their second win in a row, this time at #1d 8-6. They duo heads into spring break undefeated in their freshman year! JV is off to a 2-0 start heading into the break. Sarah Scheidler competed at #1s winning 5-3, 4-1. Katie Guymon and Caroline Machala walk away with a 5-3, 4-2 win at #1d. Maddi Felts & Heidi Copple won at #2d while Nadia Stuart & Zizi Wuensch won at #3d, neither team dropping a game en route to a 4-0, 4-0 win. Gabby Croddy & Peyton Bean won at #4d 4-0, 5-4. Katie Guymon stepped in at #1s losing a close first set 4-5 (4), before falling 0-4. #1d Sarah Scheidler & Heidi Copple fell in a decisive 2-4, 1-4 duel. The only win of the night came at #3d where Nadia Stuart & Zizi Wuensch won 5-4 (4), 4-0. As Coach Clark’s legacy lives on, win that first game of the second set and you never know what can happen! In an all doubles duo, the Lady Trojans won 5-0. Sarah Scheidler & Katie Guymon were victorious at #1d 4-1, 5-3. In a tough three set win #3d Nadia Stuart & Heidi Copple split sets coming away with the win 4-2, 2-4, 7-4. The doubles had themselves a night! Heidi Copple and Maddi Felts won 5-4(4), 4-1 in their first match at #1d and went right back on against #2d winning 4-0, 4-1. Nadia Stuart and Peyton Bean won at #3d 4-2, 2-4, 10-8. These two were down 6-8 in the third set tiebreak and strung off four points in a row to win the match and yield a tie for the team! Katie Guymon faced two very strong Lady Irish players at #1s & #2s, but gained some traction in through her second match before falling 3-5 in the final set. Gabby Croddy faced a similar tough foe at #3s. Despite her best efforts to outlast and outrun her opponent, she fell 2-4, 3-5. Sarah Scheidler took care of business at #1s 6-1, 6-1. Caroline Machala and Maddi Felts at #2d played to a solid 4-2, 4-2 win and Nadia Stuart and Heidi Copple reached the magic three with a 4-0, 4-1 win at #3d. Lady Trojans crushed it in this match. Addi Laux, Katie Guymon, & Gabby Croddy each went 6-0 at #1-2-3s. Caroline Machala & Maddi Felts went 6-0 at #1d. Heidi Copple also took care of business at #4s with a 6-2 win. Our only win was at 5 doubles by Lele and Sylvie. This was Guerin’s 6th match of the season and only our first. Guerin had 24 girls and no singles players. Therefore, our two singles players ended up playing doubles together in the number 2 spot. Two good singles players do not necessarily make a good doubles team (which I knew…) Lineup: Sarah S & Mel J (1-8) (6-3), Merritt & Monica (0-8), (1-5), Elena & Leah ((2-8),(6-1), Lilli & Sarah G (0-8), (4-6), Lele & Sylvie (8-5), (6-1). Things to work on for everyone: Court awareness (getting balls from other courts), returning harder serves, staying out of no man’s land and being in position, looking forward when up at the net, remembering basics at net (squeeze and freeze, not swinging), knowing the score at all times and calling for help when needed, giving praise to the other team “good serve, nice shot”, being more active on the court, talking to your partner. Guerin’s 1-3 doubles were very tough, hard serves, and consistent.